A team from University of Southampton Auditory Implant Service has been selected to be part of a £3.5 million improvement programme by independent charity the Health Foundation. The Scaling Up Improvement programme supports seven projects in the UK to take their proven health care interventions and approaches and make them work at larger scale to have a positive impact on patient outcomes. The programme will run for two and a half years and each project will receive up to £500,000 of funding to put their project into practice and evaluate it. During a six-month clinical trial in 2016, also funded by the Health Foundation, the Auditory Implant Service worked with 60 patients to determine whether their routine annual check could be replaced with home tools personalised to their needs. 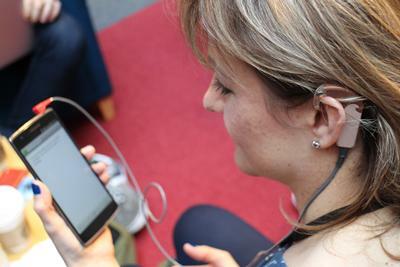 During the trial, half the participants continued with the standard clinical programme, while the other half used remote tools to monitor their hearing and perform their own hearing rehabilitation and device care at home. Those patients using the remote tools were significantly more empowered after the trial. Patients and clinicians were keen to continue using remote care, with the most popular aspect being the home hearing test. The Auditory Implant Service will lead the telemedicine project and will work in partnership with a wide range of organisations to deliver the project, including University of Nottingham, Newcastle University, Wessex Academic Health Science Network, The Ear Foundation and the National Cochlear Implant Users Association.